Study bugs with this delightful week-long bugs theme. Just pick your favorite books and educational activities and have a fabulous week learning with your kids! Read your favorite book (s) every day of the week. Keep in mind that kids love repetition, so they won’t get bored! Don’t forget to check out these fun bug activities to complete each day starting with this free backyard critters printable pack! Improve your children’s fine motor skills with this fun snail sticker craft! 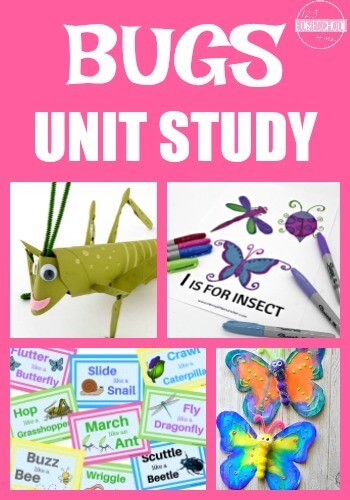 Practice measuring bugs or choose a different math activity! Teach your older kids about symmetry by drawing the missing half of an insect! Make walnut bugs with your kids! Challenge your older kids with this cardboard tube grasshopper recycling craft! Learn about the life cycle of a ladybug with these fascinating worksheets! Don’t forget to make a lightning bug paper circuit card with your older kids! Bug Social Studies and Fun! Entertain your kids with a bug sensory bin for kids!